Discover our Selection of Vintage Turquoise Bracelets, Antique Turquoise Bracelets, Estate Turquoise Bracelets and Modern Turquoise Bracelets. A beautiful 14 kt floral bracelet with 4 turquoise beads and 3 pearls. 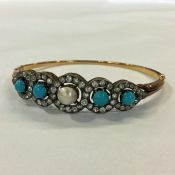 A beautiful 15kt (English) yellow gold Victorian hinged bracelet with 30 beaded turquoise and 5 seed pearls. One nine (9) karat yellow gold bracelet. Five (5) oval cabochon turquoise. 7.5'' in length. One nine (9) karat bracelet. Five cabochon turquoise. Ten (10) seed pearls. The bracelet is 7.25'' in length.